-It actually happened. 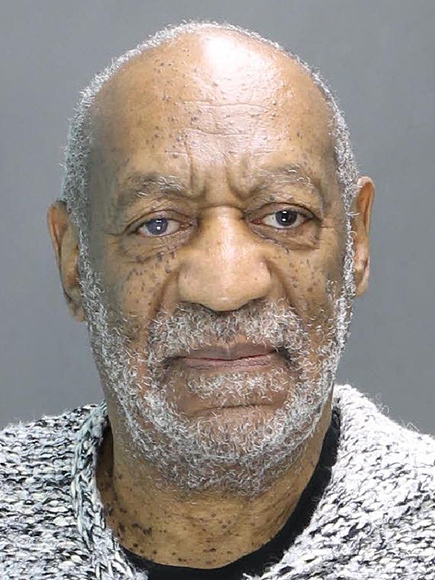 Bill Cosby was charged today with second-degree felony on a 2004 sexual assault charge. His bail has been set at $1 million. I have to say, there was something immensely satisfying about watching his perp walk. -The Toronto woman who accused him, Andrea Constand, sued the former prosecutor for defamation a few months ago (during an election year!). She went after Cosby and the prosecutor who wouldn’t charge him for more than a decade like a goddamn boss. -In other court news, an LAPD source says Mark Salling had images of girls under 10 on his computer. Sigh. -Here come the Gwen Stefani baby rumours. I’m not believing this because A) she’s 46, B) it comes from In Touch, and C) did I mention she’s 46? –Jeremy Renner finalized his divorce from Sonni Pacheco on Monday, and he has to pay $13,000 a month in child support. Looks like someone needs to flip more houses! -Wait, Matthew Goode is shooting a wine show?! Between this and Stephen Amell‘s Dudes Being Dudes in Wine Country, it’s a really good time to be a fan of watching hot famous guys getting drunk. –Sarah Silverman is standing by her “Jesus was gender fluid” tweet because she’s a brave, brave soul. –Sia’s 40th birthday party was attended by Jennifer Aniston, Jeff Probst, Sandra Bullock, and some drag queens. -I didn’t even know that Emma Stone and Ryan Gosling were starring in a movie called La La Land but the first photo from it has been released and I already want to give it all my money. -Oh hey, Matt Bomer on the cover of Men’s Fitness. How you doin’? -Is any celebrity photographed on the beach more than Katie Cassidy? She must have all coastal paps on speed dial at this point. -No photo has ever been so perfectly captioned. –Blake Lively gave Ryan Reynolds a stuffed Deadpool, dressed in assless leather chaps and holding a chimichanga while riding a unicorn. Fine, you win this round, Serena! -I really doubt Jennifer Garner is dating Patrick Dempsey. I mean, did she forget what he did to her in Valentine’s Day? Um, not that I’ve seen that movie. Repeatedly. -So how many times have y’all watched Aretha making Obama cry with “Natural Woman”? I’m up to six…teen. –Benicio Del Toro and Tim Robbins are war zone rescue workers in the new trailer for A Perfect Day.